I really liked this short—and it was short, it is part of Borough's Publishing Group's Lunchbox Romance line. A wonderful line of books for those who are looking for a good read but have little time. a young woman working in a jewelry store for a rude older man, her bother, Patrick, has just died and she has not even had a day to mourn as she must go to work to be able to afford rent. As she rushes to work, distracted and hurried as she is, she bumps into a man. This is the first meeting between them and though brief and Kitty very distraught over her brother's death she tries to commit the beautiful man to memory to paint him later before she rushes off. She gets another chance to see him though when Phillip (the man she bumped into) visits the shop she works in. It is soon after that we learn he is a vampire. The story really takes off from here and I have to say it kept me very entertained in the happenings and it was a quick read which, as busy as I am on the average day, was wonderful! Overall I really liked The Shopgirl and the Vampire and I look forward to reading a full length novel by author Ciar Cullen. 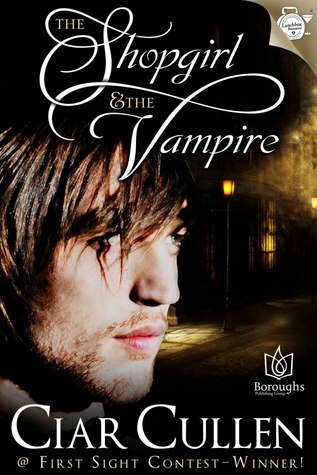 I would recommend The Shopgirl and the Vampire to anyone looking for a quick paranormal read.